St. Peter’s Basilica (or San Pietro in Vaticano in Italian) is probably the most famous architectural specimen from the Renaissance period. 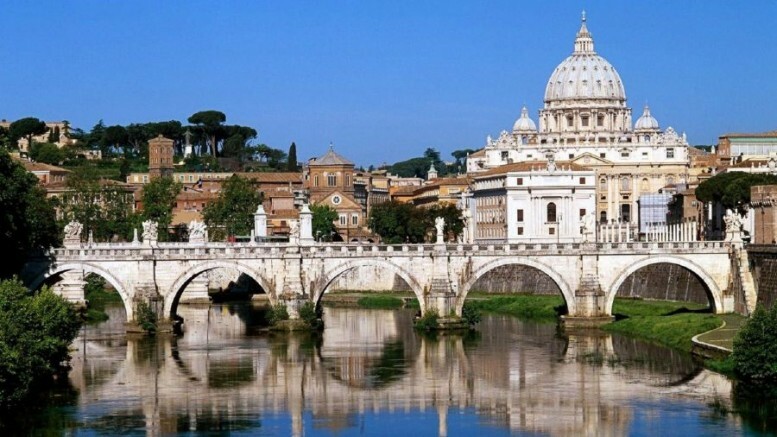 The grandiosely designed church (which still remains one of the largest in the world) was built on the burial site of the namesake St. Peter, who was one of the twelve apostles of Jesus, and is also venerated as the first Pope and Bishop of Rome. And interestingly enough, in spite of not being the ‘mother church’ of the Catholics (the honor belongs to the ‘Papal Archbasilica of Saint John Lateran’), the magnificent basilica is considered as one of the holiest sites of Catholic Christianity, and also the greatest of all churches pertaining to Christendom. The Church of St. Peter with its Greek-cross plan, accounts for an astronomical 22,300 sq m (or around 240,000 sq ft) – which makes it the largest church in the world in terms of area with a capacity for 60,000 people (though there might be larger churches in terms of overall volume). This main basilica structure is fronted by a gargantuan elliptical-shaped entrance space (or piazza), whose oval scope designed by Bernini, measures 340 by 240 m (1,115 by 787 ft). Simply put – St. Peter’s Basilica is not the seat of a bishop (the bishop in this case being the Bishop of Rome i.e., the Pope), and hence it can’t actually be considered as a cathedral. As we mentioned before, the Pope’s ‘own’ cathedral pertains to the Archbasilica of St. John Lateran – which by this reason, remains the mother church of all churches and parishes with Catholic denominations. 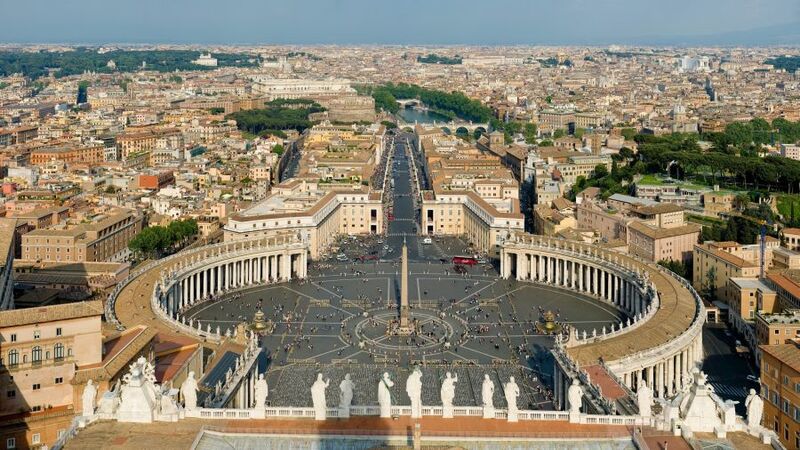 However, St. Peter’s Basilica is counted among the four Major Basilicas of Rome, and is also used as the principal church by the Papal authorities mainly due its sheer size and prime location within the Vatican compound. Furthermore, the grand basilica also houses the ‘Chair of Saint Peter’, which in accordance with traditions, is an ancient chair used by St. Peter himself. In many ways, the relic symbolizes line of apostolic succession from Saint Peter to the present pope, which makes the basilica his proverbial seat of power. But as per historical evidences, the exalted ‘chair’ was found to be a gift from Charles the Bald to Pope John VIII, and it was presented in the year of 875 AD, which is more than 800 years after St. Peter’s presumed lifetime. 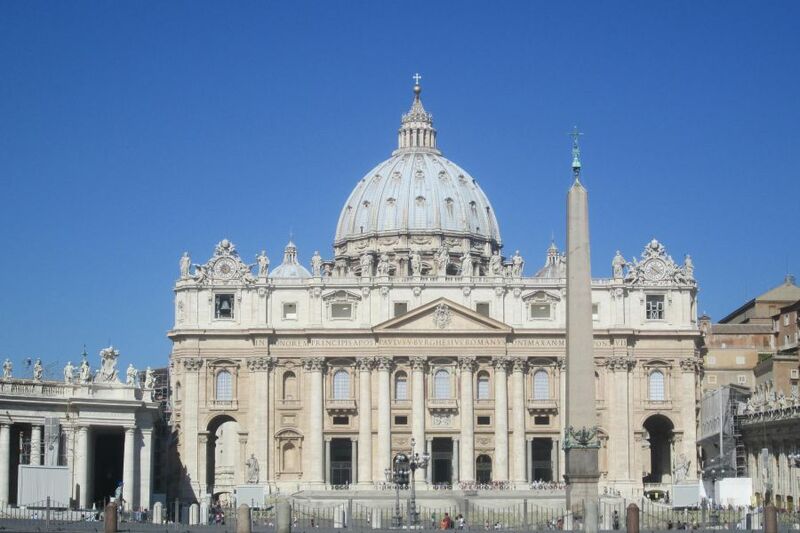 2) St. Peter’s Basilica’s structure had been in ‘construction’ for over 1,300 years! 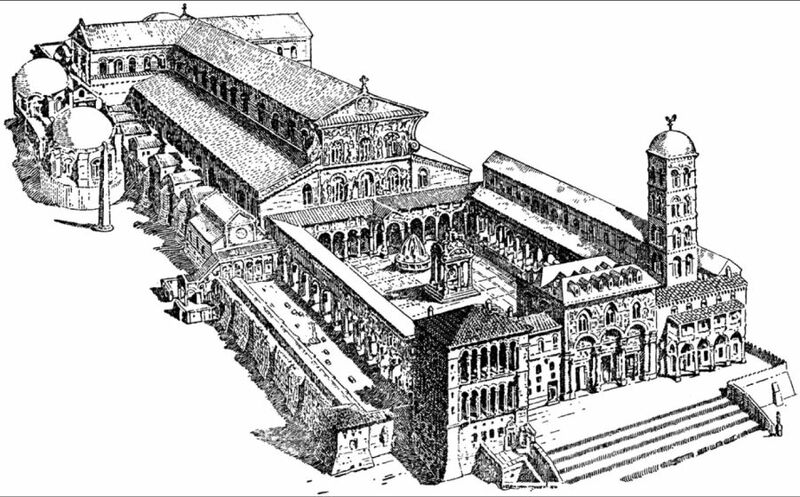 The Old St. Peter’s Basilica was originally constructed on a small shrine that supposedly marked the burial site of Peter. It was built on the orders of Roman Emperor Constantine I, with the construction starting from around 322 AD and taking almost 50 years to complete. However, the 103-m long structure had already started to crumble by early 15th century, and as a solution Pope Nicholas IV opted for a more impressive replacement. Unfortunately, he also died in 1455 AD before the bold endeavor could begin. In fact, death and creation played out their game of tug-of-war for the next 170 years, with numerous architects (including Bramante, Raphael, Sangallo and Giocondo) dying before they could see their fruit of labor. Finally, it was Pope Urban VIII who got the grand opportunity to consecrate the new St. Peter’s Basilica on 18th November, 1626. 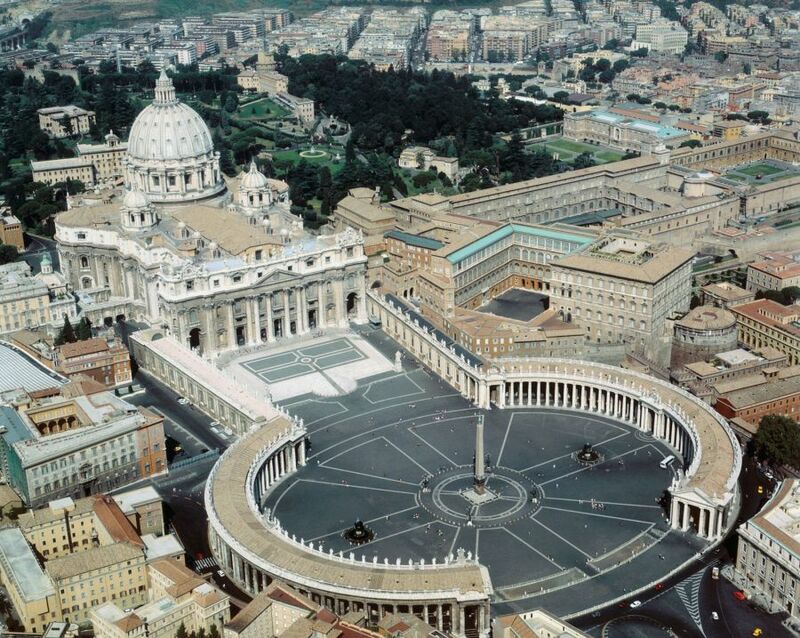 The huge Piazza di San Pietro or St. Peter’s Square (designed by Bermini) was built at a more rapid rate, and was thus finished by 1667 AD after eleven years of hard labor. The center of the St. Peter’s Square boasts of a 25.5 m (84 ft) high obelisk which most probably dates from 13th century BC Ancient Egypt. The entire red-granite structure was actually transported to Rome (by orders of Caligula) in 1st century AD as a central spectacle of the Circus of Nero. The obelisk was again moved in 1585 AD, this time on the orders of Pope Sixtus V. The mammoth task of hauling the monolithic tower was achieved by 800 men, and that too discreetly under the pain of death. Modified with a cross at the top and at the base, the obelisk does go to total height of 40 m (132 ft). As for its momentous installation in the piazza – there is a symbolic side to the whole affair. This is because Saint Peter’s alleged crucifixion in 64 AD took place near the position of the obelisk, when it was placed in the Circus of Nero. So, the upright stone is revered as a ‘witness’ to his martyrdom, and is also counted as one of the ancient Obelisks of Rome. After the passing of Bramante and Raphael, Michelangelo took up the grand project at a ripe old age of 71. According to his own words, the inspiration came “for the love of God, the Blessed Virgin, and St. Peter”. But beyond just poetic words, the ‘Il Divino‘ had his task cut out for him, and he boldly retorted by dismissing the Latin Cross plan initiated by the great Raphael, and reverting to the Greek Cross. Michelangelo was also known for basically simplifying the visual ambit of St. Peter’s Basilica by modifying the structure into a more cohesive unit. The dome remains his ‘piece de resistance’ with its magnificent impression on the visitor being generated from a distance. 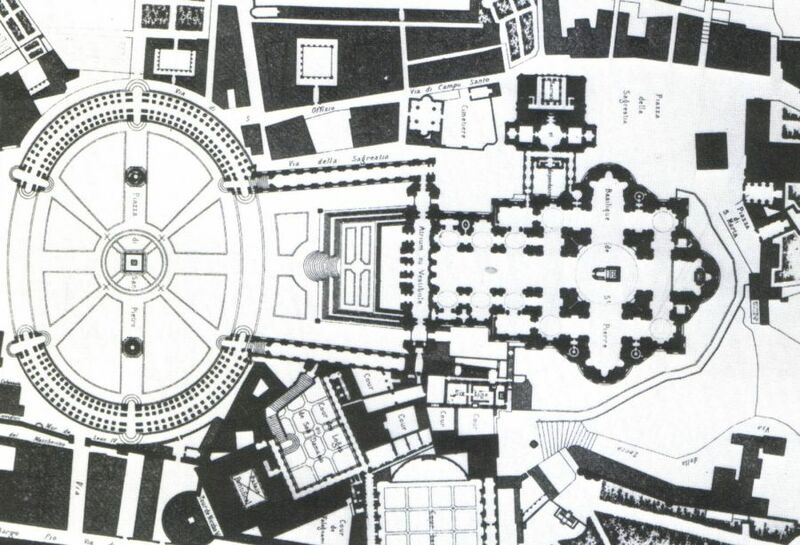 In essence, the strictly geometrical forms preferred by the earlier architects were subdued with the inclusion of circular, semi-circular and massive masonry components – thus endowing a ‘collective’ effect with gradual angles instead of sharp perpendiculars.